Moo0 FFmpeg is a custom Windows build of FFmpeg, an excellent command-line video conversion tool more known in Linux world. Using this tool, you can convert most kinds of video / audio files into others, including FLV and other video formats using XviD / x264 codec. Here is the sample list of formats / codecs it curently supports. - Video Format: AVI, FLV, M4V, MKV, MOV, MP4, MPG, OGG, OGV, RM, SWF, TP, TS, WEBM, WMV and many more. - Video Codec: H.263, H.264 (x264), Mpeg2, Mpeg4 (DivX, XviD and its own), RV10, Theora, VP8, WMV (v7, v8) and many more. - Audio Format / Codec: 3G2, 3GP, AAC, AC3, ADPCM, AIFF, AMR (NB, WB), AU, FLAC, GSM, M4A, MP3, MP4, OGG, PCM, RA, VORBIS, WAVE, WMA and many more. Additionally, this package adds some extra enhancements to increase the usability for Windows users. Yet, you may possibly get lost in using unfamiliar command-line operations at first; however, please keep on trying a while. It gets very easy once you get used to it. This package is licensed under GNU General Public License Version 3 or later. Please follow the license for its use and distribution. All the source codes used can be found at Here. Please tell your thanks to them, if you like this excellent tool. - Supported Windows 10 finally. - Quick bug fixes in which the recent versions couldn't be installed on Windows XP/8.1. 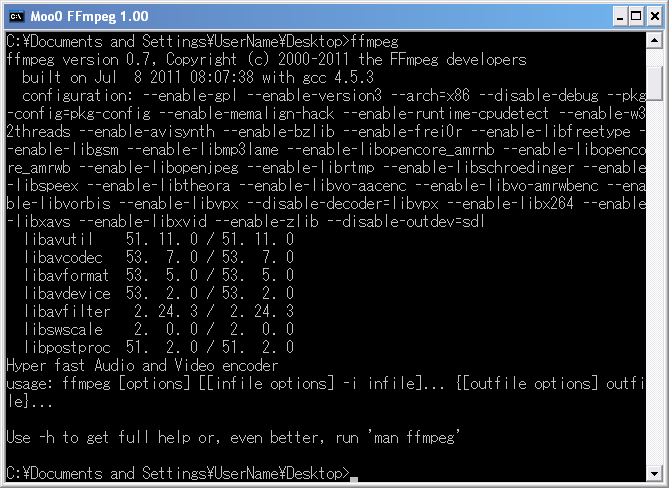 - Upgraded the core video conversion engine to FFmpeg 3.4.1. - Updated the core video conversion engine.